This is my day-to-day experience with the Keto Diet. I'll share my success, failures or any obstacles I encountered as a novice and workarounds I have found. I hope my knowledge will help other beginners to successfully learn to properly abide by the well-known heavily-reasearched Keto Diet. The very first challenge I encountered was the net carbs. The Keto Diet is based on carefully tracking the carb intake, but there is a catch. According to where you live, the "carbohydrate" value on your nutrition sheet might mean two entirely different things! In the US it means the total carb content, while in the Europe and the UK it shows the so-called net carb content. Here is the catch. The thing is the Keto Diet daily carb intake restriction is actually net carbs restriction. Lot of tracking apps, including MyFitnessPal (MFP), do not take this into consideation. What's even worse, the databases of some tracking apps, including MFP, are filled with unvalidated entries (from the users) tak mix up the total and net carbs! And the difference can be really noteworthy! Take 100 grams of almonds, for example. If your daily intake of carbs is around 20 grams, which is quite common, you would be off by 22 - 9 = 13 grams of carbs! That's an error larger than half the recommended daily carb intake. The reason this is important is the fact that the fibre is not digested and hence can't be added to your daily carb intake. I had to scratch my whole MFP progress and find a new app that takes this crucial fact into consideration. Granted, there is a script for MFP that does the math BUT with a broken databes filled with inacuracies the whole app is useless for the purposes of Keto Diet. 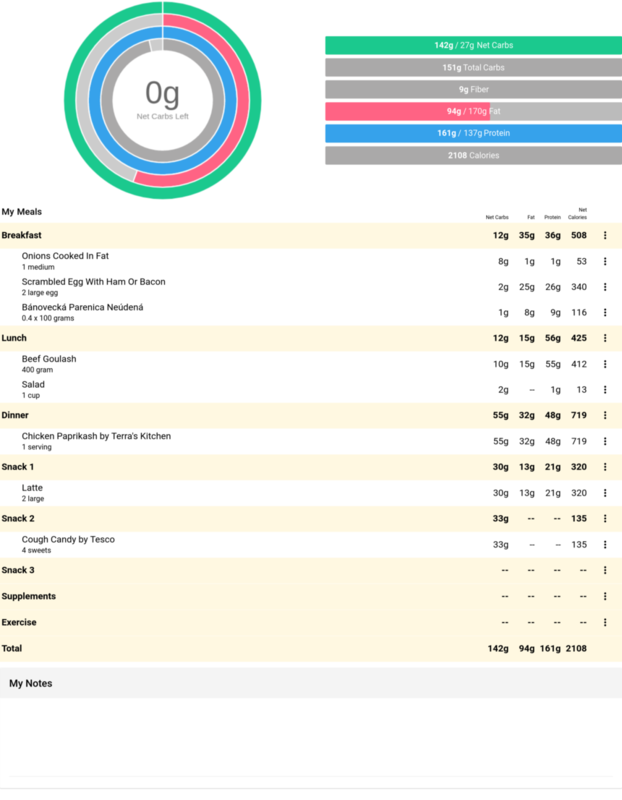 That's why I spent (literally) all day looking for the best (Android) app for counting my net carbs, fats and proteins until I found the Carb Manager. It is not perfect - the barcodes of many foods I come across are not recognized, which is particularly annoying as I have to enter the food manually. Nevertheless, I appreciate the food recognition feature, I find it really cool. It helps, a bit. Now let's come to the food part. I set my goal to loose .5 kilogram per week given the sedentary lifestyle and of course the built-in 5:70:25 (net carbs / fats / proteins) ratio for Ketogenic diet. How did I manage? 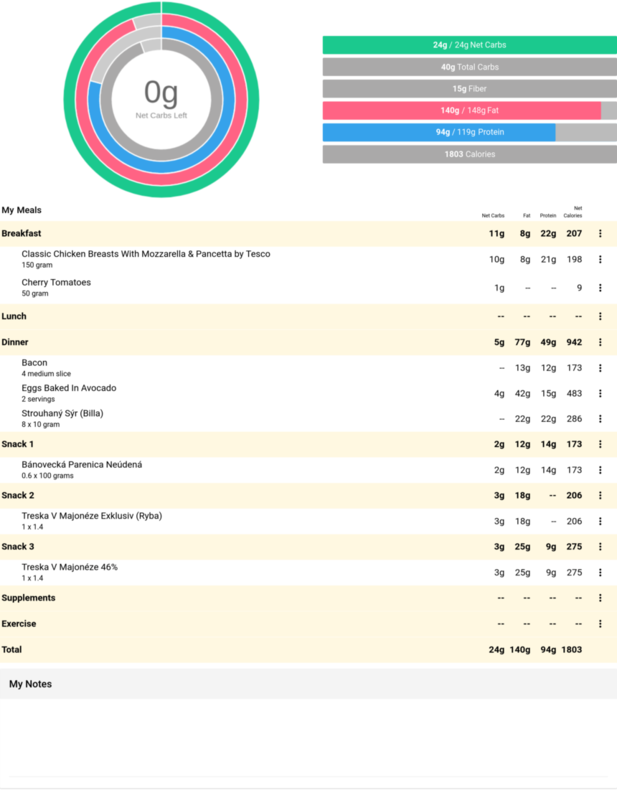 I ate 25g (11.4%) : 126g (57.3%) : 69g (31.4%) of net carbs, fats and proteins. That's a little off by +6.4% : -12.7% : +6.4%, but I managed to stay bellow my daily calorie intake, which was estimated to 1567. I ate 1529 calories and still have 38 calories to go! And how do I feel? I have a mild headache and I am quite tired. My urine test shows I am in a mild ketosis. Needless to say, I started a very low carb diet two days in advance, but had to scratch the progress due to the net carb fiaco. I am a bit hungry at the end of the day, but not much. 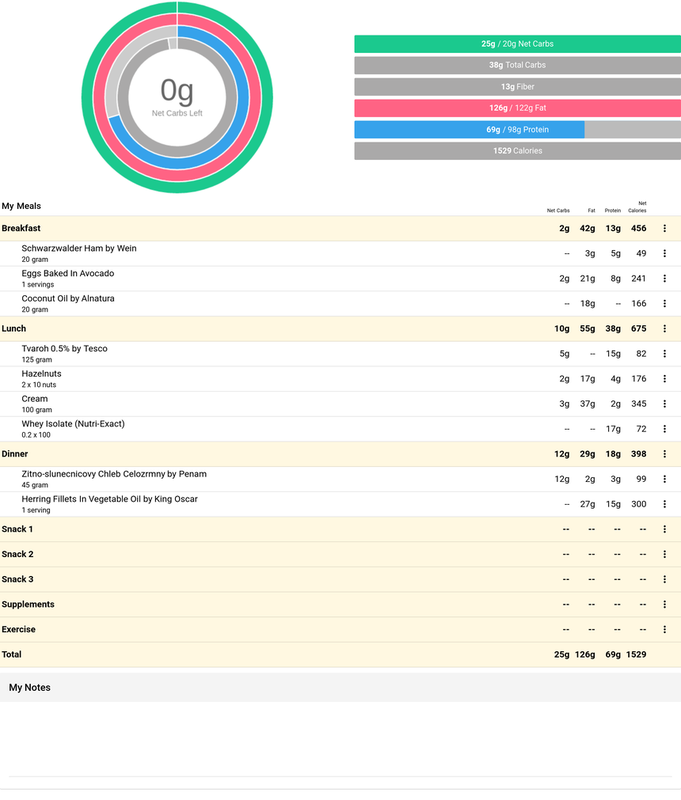 Could still eat some more proteins to increase satiety, but it's hard to do without ingesting any more net carbs. I'll try a bit of fasting, as it is well-known that ketosis is mainly induced by the overall lack of food. That's my first day on Keto, hope you liked it. Stay tuned! P.S. : I would prefer writing this in a form of blog, but I found no such option here on Carb Manager forums. Maybe someone can point me to a way to better express this kind of content. I'd appreciate that, thank you. Here's what I ate on my first day on Keto. Yesterday night I was so hungry I was forced to eat one herring (50g) and a protein shake (35g) before I went to bed. Not to worry though, because proteins was just what I was missing to meet my daily Keto macro goals. 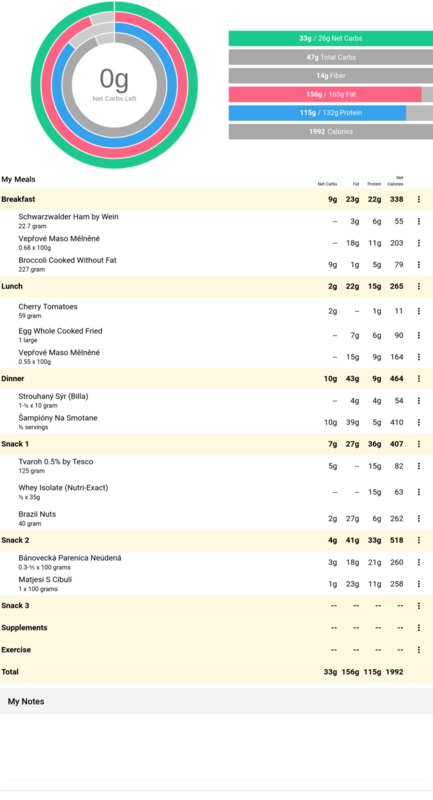 The funny thing is that proteins are best macros to increase satiety, which means I didn't go to sleep hungry. Which is a good thing as we all know being hungry slows down the metabolism and causes the so-called jo-jo effect. How I met todays goals? The results are very promising! Not only did I stay bellow the given caloric deficit, I managed to not exceed the allowed carb intake. Actually a save almost 20% of the given carb budget! Nice job. 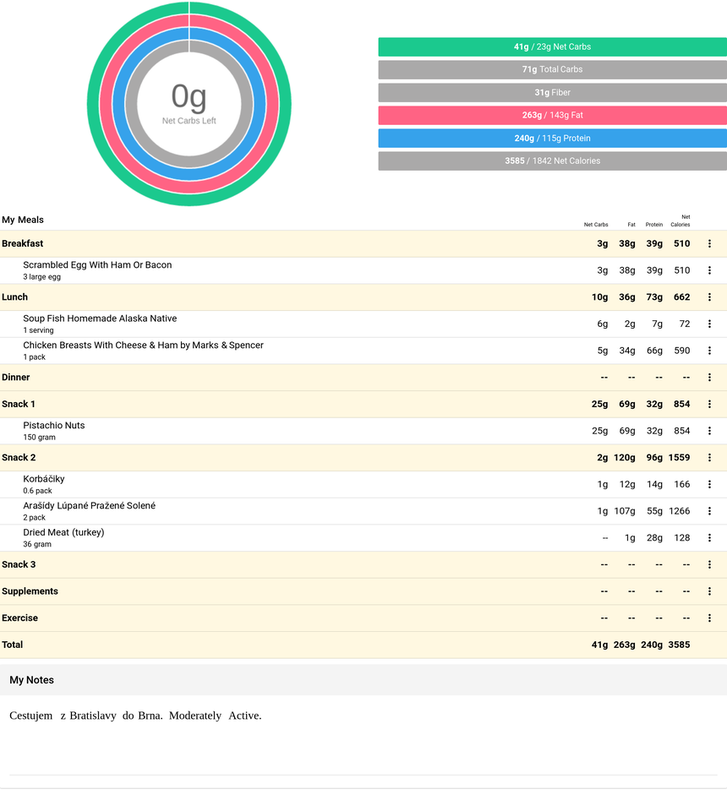 The urine test still shows a state of mild ketosis, perhaps a bit more vivid readings now. The headaches are gone, I still feel kinda tired occasionally, but I am not hungry at all. Here is my Day 2 menu. slazer It looks like your doing well. I know if I didn’t go over a little on my proteins at first starting out I was hungry a lot. I didn’t micro manage so much at first until fat adaption good over. Going to bed on an empty stomach was not a good idea and I didn’t sleep well when I did that. I made sure to have dinner later or at least a fuled snack. Keeping the room temp lower helps also. Now I don’t hit my macros at all, I don’t eat as much. Calories lessened per the week. Today, I was betrayed by an onion. And broccolli. Looks like these two veggies contain quite a lot of net carbs. Apparently, a lot of the fiber contained in onions is suluble, hence is digested and has to be counted as net carb. What's more, I decided to temporarily change my "Weekly Weight Change Goal (kg)" to "No change", meaning maintining my weight instead of trying to loose some. I am a bit sick (sore throat, bronchitis), definitely don't want to be hungry and all this overhead is a bit overwhelming so I decided to cut myself some slack here (no pun intendend) and temporarily decrease my goals in favour of psychological well-being. The good thing is I managed to stay way below the calorie intake and hence managed not to gain any weight. The disaster thing is I exceeded the net carb intage by... a lot! Nevertheless, the urine test still conclusively confirms I am in a state of mild ketosis. From the readings I'd say it's around 2 to 3 mmol/l which is safely inside the boundaries of induced/nutritional ketosis. The boundaries for nutritional ketosis are 0.5 to 3.0 mmol/l. This indicates I might have somehow miscalculated the carb intake for broccolli and onion OR it might also mean that small variance in net carb intake might not necessarily put you out of ketosis. Anyways, I survived another day. Here is my Day 3 menu. Tip: The best time to do a urine test is right after waking up. If you happen to dramatically increase your liquid intake, it might decrease your ketone urine levels to the point your ketosis tests come back negative. On the other hand, if you do the test after physical activity and before having anything to eat or dring, the amouth of ketons increases significantly. Make sure you do the readings under the same conditions everytime. On Day 4 of my diet I was eating out for the first time. 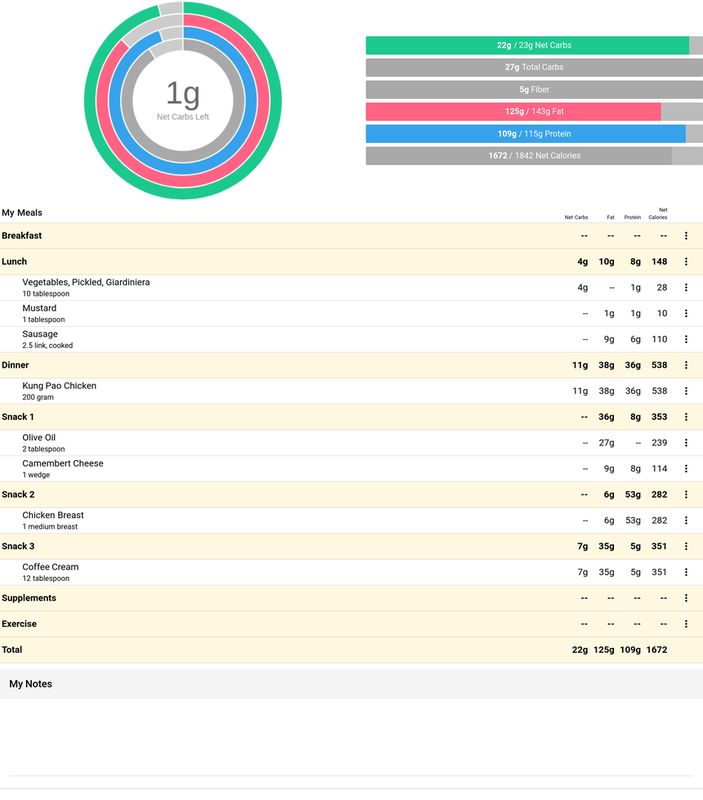 I ate a kebab, it was okay, but the cabage contained whole 10g of net carbs. Never mind though, I managed to take care of my daily intake. Macro intake was OK and caloric intake suggests I'll loose .25 kilogram a week. Urine tests still confirm mild ketosis, of course. I am a bit tired, no big deal. Sleeping well. 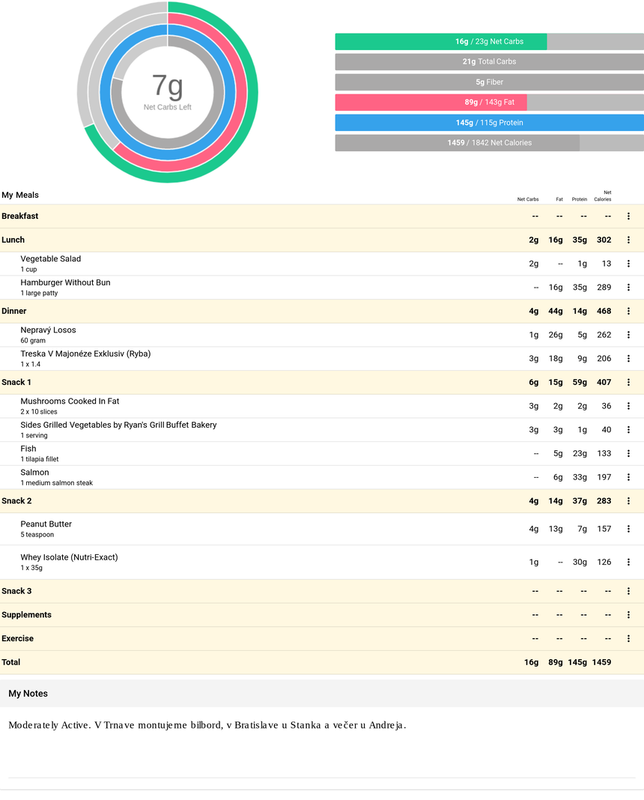 On Day 5 I managed to perfectly weight in my macros as well as calories. I should loose .75 kilograms pre week at this rate. Look at this, it's awesome! Isn't that awesome? It is! slazer looks like you have it under control! How much weight do you plan to lose and what is starting weight? NLDSK Starting weight was 77 kilograms, but I do not take that into consideration at all. More than that I consider the Body Fat Percentage (BFP), which I do measure every two weeks. I do not have the exact number now, but I think I started at around 9 percent of BFP. I do not have a set goal. The goal is really to get rid of the layer of fat covering my abdomen muscles to reveal them (have a 6-pack) as well as to loose some hip fat. The BFP number is really just to confirm I make some progress. Same stands for the urine tests for ketosis. I need some output. Today I was kicked out of ketosis. I repeat, out of ketosis! This is Day 6, stand by for more info. I accidentaly ingested a few sweet cough drops for my sore throad and bronchitis. They contained honey. By noon I was testing negative for ketosis and I am still testing negative at the end of the day. The good thing is the tests seem to work. The disaster thing is by how much I have exceeded the carb intake. Look for yourself. Nevertheless, there is a light at the end of the tunnel. The caloric intake was quite low. In fact, I am on to loose .5 kilograms per week by this rate. I'm not in ketosis though and I wonder how long is it gonna take to return where I was. I am continuing on my diet. I have exceeded my carb intake by... wait for it... a whole 426%! Okay, it was not only the cough drops. I though a latte would not contain more than half my daily carb intake. I had two. I also exceeded the proteins, making some room for gluconeogenesis. There is really no wonder the tests came back negative. Shame on me. To lighten this up a bit, I'm gonna post the pictures of my belly to show y'all how am I doing. Stay tuned 😄. slazer I would be kicked out of ketosis if I ate goulash. slazer why wouldn’t we need pics of your belly? lol! slazer don’t kill yourself for mistakes, especially you were sick. Stay strong! I wonder if eating carbs in cough drops induced desires for latte. I was shocked to find out how much carbs are in milk and dairy products... Today is Friday, so good luck to all to stick with Keto this weekend! Dr. Atkins was a heart specialist who wrote this book for his patients (who were so obease they were going to die, or they had to lose enough weight that they could have their stomach stppled.) As a side effcet he found that by putting them on a low carb diet not only lowered their blood sugars and they lost tremendous amounts of weight. He did a study On a tribe that did not have all the sugars, etc available to them. He studied them the next 20 years as sugar made it’s way into their diets and found the same problems with weight we are seeing today. I do not count anything but net carbs (Diabetic Carbs)—-nothing else. I have been bed ridden with a herniated disk in my back since November 28 and not allowed to exercise. I started diet Jan 1, 2018 and as of today have lost 18 pounds. 4. But drastically limits the net carbs. It is estimated that 20 thousand people around the world have embraced this diet. If you run out of carbs —-simply eat meat. I will also say that I eat very fatty meats the first 2 or 3 days and I am in ketosis on day three. I run about 80mg/ld on my Keto sticks unless I eat straight meats then I can go all the way to the top of my stick. If the diet you are doing becomes to frustrating—-try this. It has worked for me after each pregnancy and it working for me now. My lowest calorie day was around 700 something calories and my highest calorie day was around 2300 that day (When averaged for the month the total came to about 1100 calories a day). You will not feel hungry on this diet because of the fat (which adds flavor and the sensation of being full) and the fact that you can eat meats when you use up your carbs is also a big plus. Now I would not make a habit of 2300 calories a day——I just don’t pay attention—my husband figured this out in the analysis section of this app for his own interest. If you like chocolate get Chocolate Perfection 10 gram bars at 1 carb each. Eat all the meats you want—-I especially eat fatty meat like pork belly and bacon. I also take Metamucil orange flavor (No Sugar) which helps bind fats, keeps you regular—does not act like a lax that makes you go (just keeps you regular) ON this diet You will need fiber. Metamucil (no Sugar) is a convenient way to increase your daily fiber intake. Not all fibres are the same. Metamucil is the only leading fiber supplement brand with 100% natural psyllium fiber. 4 Helps you to fill full as fiber expands in your stomach. I also like Atkins bars. They are 2 to 3 carbs each. I like the Day Break chocolate chip crisp. You can also make egg muffins (no bread) scramble egg for each muffin. Put and egg, cheese, broccoli florets [bacon-ham-some meat if you wish. Great snack for on the go. I put one broccoli floret in each muffin so that would not be many (5 ounces at 4 net carbs—1 egg each 1 net carb, meats 0 carbs, and you have to pick the right cheese. Don’t forget the Choco Perfection Chocolate bars. Oh! There is a diet book called, “Dinner in Five”- 5 net carbs, 5 ingredients. I love this book. It might give you some variety. I could never count all the things you are trying to count, but I still love this app. The first month (remember the first 5 pounds are water) I lost about 16 pounds with two (two week )plateaus of no weight loss—It is thought that as long as your stick is purple (I like to stay 80mg/ld) You are losing inches. This month I have had one plateau for a week and today lost 2 pounds. I hope to lose 5 maybe 7 pounds this month. This diet is a great diaredic; I can vouche for this as I am having to take prednisone (steroid that causes water retention) for my back. When I wasn’t on this diet I would gain 10 or more pounds after four days of this—I have been on it four days today and there is no water weight as I stay about two to three pounds over my low weight in the morn depending on when I eat. I only allow myself in the light pink of a Keto stick when I am mataining my weight. I have probably told you some things you may like (like the snacks and cookbook) You may have to decide about the diet I described. I am never hungry and if I had to count calories, fats, proteins——I would just be a big beached whale here in my bed. 3. People it works fast and easy for. I hope I have helped in some way; You impressed me with all of your studying and ability to organise what you have learned. First things first - here's the picture of my belly. It has been taken on Day 10 (+2) of my Keto diet. As you can see, I am not quite there yet. I'd really like to loose some hip fat. However, there is definitely an improvement from Day 1. Unfortunately, I don't have any pictures from my first day on keto. 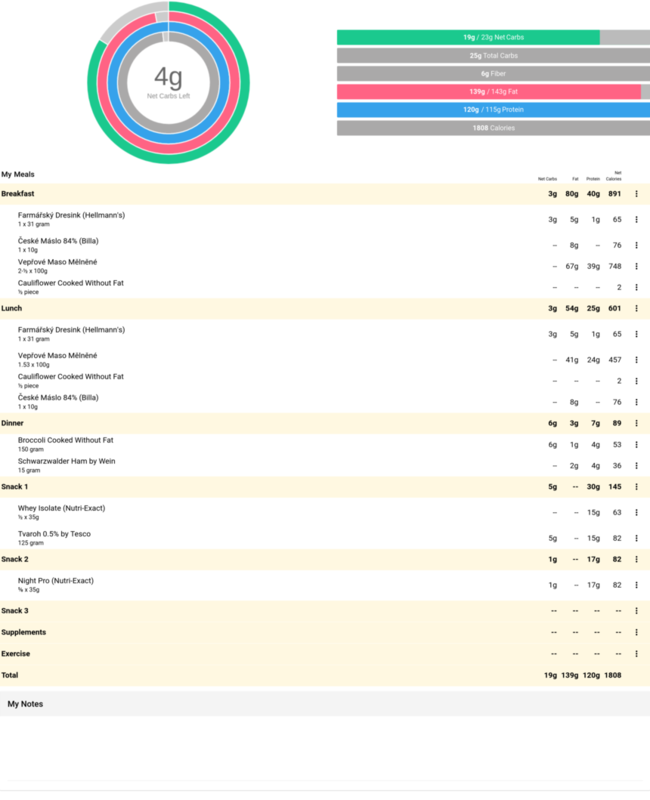 What's more interesting though is the body composition test (InBody 170) I took yesterday. It shows some amazing results! Let's have a look. The last test I took was the day before I started the Keto diet. Here are the differences between the tests. Let's comment on that. I lost a lot of muscles. The reason for that is I really had no time to eat in the past few days. I was actually starving (fasting) for most of the day, although I tried to abide the diet strictly. I definitely ingested too few proteins, hence the loss is quite understandable and expected. I wanted to emphasize this is not the fault of the diet, but me breaking the rules of this diet. You never should be hungry on this diet or any other diet! Apart from that I lost a noticeable amouth of fat, but lot of water as well. Here we can see how important it is to not only measure the raw wight, but also the body composition during the whole process. The WHR value is also a bit interesting. 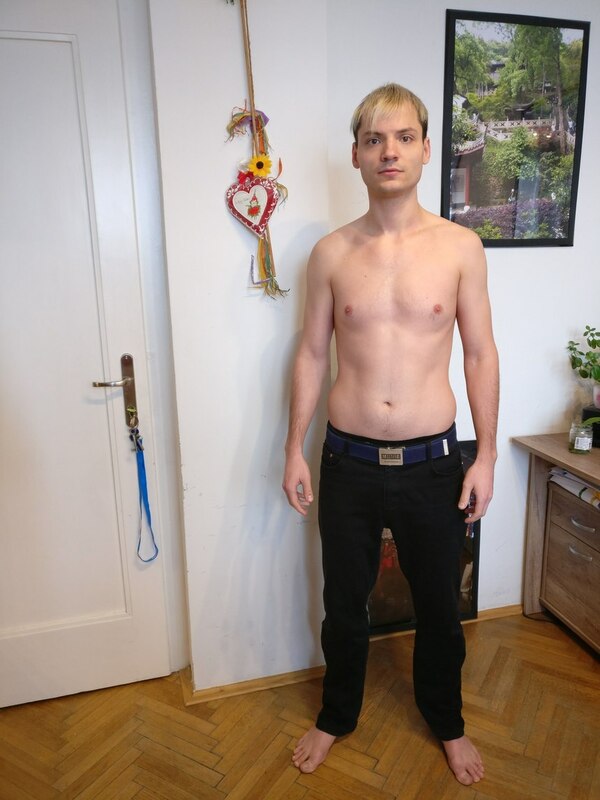 The scale says it should be between 0.80 and 0.90 and I am somwhere in the middle, which indicates I still have quite a lot of visceral fat (inside, surrounding the organs) to be burned before the body actually starts to burn the subcutaneous fat. This stresses the fact how patient you have to be during this diet, or any diet. So what's the overall story? The muscle loss was noticeable, but not substantial. I should definitely ingest more protein and probably do some weight lifting to gain back my losses, but I am not concerned much about my muscles. I want to proceed aggresively towards my fat loss, even at the expense of minor muscle loss. To do that, I am going to do High Intensity Interval Trainings. To protect my muscles, I will ingest MCT oil, vitamins, lecithin as well as some protein supplements. Starting today. Here are my menus for days 7 to 12. On days 7 and 11 I didn't take any notes, although I was trying to sctrictly abide the diet, apart from the fact I was fasting too much. Overall, I believe I was in a substantial caloric deficit each day. Maybe .25 to .5 kilograms per week. swamppqueen1ead Hi Beverly! I have read your reply and it's certainly full of interesting information. I will read it more thoroughly in a few days and take a look at your recommended sources. Thank you, have a good day. Thanks for posting! I had a similar experience with MFP. Been using it for 4 weeks since I started the Keto Diet on Feb 26. 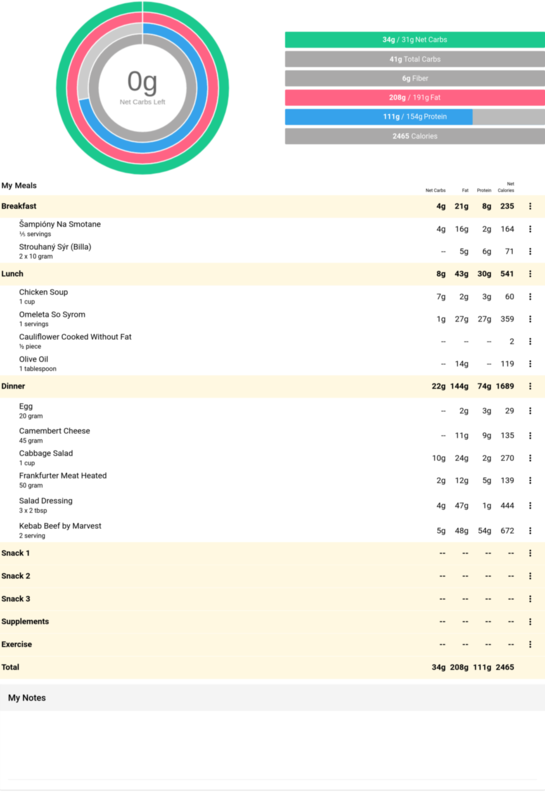 I found Carb Tracker and I hope tracking Net carbs will help me be more successful. Haven’t lost much since the first week. 1. There are people this diet does not work for (My husband who is a doctor) .... who are these people? How do I know if I am one of them? The only way to know if it works is for you is to go on the diet and try it for a month and see how fast you go into ketosis. Get the ketosis sticks. I can get into ketosis in 3 days, some people take a couple of weeks. This will give you an idea of how sensitive you are to this diet. Remember I only eat about 14 carbs or less a day. The more carbs you eat the longer it will take to get into ketosis. I am sorry it took so long to respond to you. I hope this is helpful.